FMLWS New Release: Update Fall 2018 – Where Are We Now? A Re-introduction to Maltby Lake. Read the full release here. Saanich, BC – Watershed stewards across the province dedicated to the promotion of clean and healthy water sources, took to their local lakes during the month of July to measure water transparency (turbidity) using Secchi disks and other testing instruments. This year marks the 25th Anniversary Secchi Dip-In. Data collected is used to assess trends in water turbidity and contributes to the body of information needed to develop policies to protect lakes. Through regular status reports, the initiative provides communities with monitoring results specific to their local lake and educational material on lake health in general. Since 1994, more than 10,000 trained volunteers have generated 42,000 transparency records, giving a glimpse of lake water transparency at sites across North America and the world. To strengthen our interconnectedness and celebrate all the volunteers who work to restore and protect our precious watersheds, I am very pleased to invite you to a dinner and family-friendly event: I (heart) Watersheds. It will take place on Saturday, Nov. 26 at the Cordova Bay United Church, from 5:30-9 p.m. The event is sponsored by my constituency office as well as the Peninsula Streams Society, Friends of Maltby Lake Watershed Society and the Cordova Bay United Church, with special thanks to the Capital Regional District and the District of Saanich. Habitat Acquisition Trust volunteers help to save local frogs, salamanders and other amphibians. Carmel and Woody Thomson show how love of place can keep it safe. “Vancouver, BC – The Land Conservancy of B.C. (TLC) received approval today from the Supreme Court of B.C. to transfer 27 conservation properties to The Nature Trust of B.C. (TNTBC) and The Nature Conservancy of Canada (NCC) for an agreed upon amount of $1.5 million. “Victoria, BC – The Supreme Court of B.C. approved the Plan of Arrangement as agreed upon by The Land Conservancy of B.C. (TLC) and its creditors on April 2, 2015. The Court has also approved the sale of a portion of TLC’s undivided interest in Maltby Lake in Saanich. …TLC received its 35% undivided interest in Maltby Lake as part of the estate of Catherine Holmes in 2009. The Offer to Purchase 29% of TLC’s 35% interest was accepted from one of Catherine Holmes’ family members, Woody and Carmel Thomson. The Thomson’s Offer of $750,000 includes a protected area designation upon partition or subdivision of the property. The Friends of Maltby Lake Watershed Society, a local conservation group supported by the community and various levels of government, have expressed interest in providing TLC with a contribution for the remaining 6% interest. The transfers will see the original donor’s intentions upheld and the site protected. “The Land Conservancy of British Columbia is officially on its way to climbing out of its financial quagmire after its survival plan won court approval Thursday. “In the future, The Land Conservancy of B.C. would own just a few properties under a proposal that would see many of its current holdings going to other conservation organizations as it aims to get out of $8 million in debt. FILED WITH SUPREME COURT OF B.C. Victoria, BC – The Land Conservancy of B.C.’s Plan of Arrangement was filed with the Supreme Court of B.C. on February 23, 2015. The Land Conservancy of B.C. (“TLC”) sought protection pursuant to the Companies’ Creditors Arrangement Act(CCAA) in October 2013 as a means to definitively resolve the organization’s debt to secured and unsecured creditors. The CCAA is federal legislation that grants an organization time to restructure while under the direction, supervision, and protection of the Court. TLC’s intention from the start has been to pay all creditors to the fullest extent possible, to protect TLC properties to the greatest extent possible, and to ensure that TLC has long-term viability. TLC has debts totaling $8,121,183.02 including $4,528,658.51 in secured debt and $3,592,524.51 in unsecured debt. Secured debt includes administrative charges incurred as part of the CCAA process, municipal property taxes, and mortgages the organization acquired in the past to complete property purchases when fundraising fell short. Creditor’s Proofs of Claim were submitted by April 25, 2014, and the last claim was finalized on December 15, 2014. TLC’s Plan includes a multi-faceted approach to eliminating the debt. It includes innovative approaches such as density transfers, specified donations, forgiveness of debt, heritage revitalization agreements, mortgage transfers, and partnership agreements with other Land Trusts and Societies. The filed Plan of Arrangement would see secured creditors paid in full, have their secured debt assumed by a third party, or receive the mortgaged property in settlement of their secured debt, within six months. Unsecured creditors would receive payouts in three tranches within 18 months. TLC predicts that enough revenue will be generated to cover its debt, uphold the complex responsibilities that come with transferring properties donated for charitable purposes, and to remain a viable organization. Among other strategies, the Plan includes the transfer of allowable densities from Abkhazi Garden. The density sale will remove the development potential from the Garden and allow the site to be preserved with a heritage designation from the City of Victoria. A generous donor has stepped forward to pledge $539,000 to TLC upon the heritage designation being placed on the Garden. The site will remain in TLC’s care after the organization emerges from the CCAA process. Ross Bay Villa will be transferred to the Ross Bay Villa Society, a group of volunteers that have spent years restoring the site, in exchange for a contribution to cover the pay out of the existing mortgage. With the assistance of the Historic Joy Kogawa House Society, the non-profit organization that has partnered with TLC to protect the site since 2006, TLC is pursuing the application for a Heritage Revitalization Agreement from the City of Vancouver to protect the Historic Joy Kogawa House. The title of the property could then be transferred to the Society upon pay out of the mortgage from the proceeds of the agreement and after needed repairs and renovations to the house are completed or provision is made for such repairs and renovations from the proceeds of the agreement. TLC is pleased to be working with The Nature Conservancy of Canada and The Nature Trust of British Columbia to protect many of TLC’s sensitive ecological lands. The Plan of Arrangement includes 28 conservation properties to be transferred to the two Land Trusts for protection. If the Plan of Arrangement is accepted by the creditors, these transfers will ensure that the conservation values of the lands remain protected. The Court has already approved the sale of three properties earlier this year; Keating Farm, Eagle Bluff, and a development property in Sechelt. Funds from sales are held in trust by the Monitor, Wolrige Mahon Ltd., for distribution to creditors. In addition to permitting the filing of TLC’s Plan of Arrangement, the Court has ordered a meeting for creditors to consider the plan on March 30, 2015. For the Plan to be approved, a majority of those voting in person or by proxy from each class of the creditors (being secured and unsecured), representing two thirds of the total value of the debt in that class, must vote in favour of the Plan. Upon the approval of the Plan by creditors, in accordance with the requirements of the CCAA process, TLC will immediately apply to the Court for a final order of approval of the Plan. After the final order TLC will be bound to do what is required under the Plan to fulfill its terms. The existing stay of proceedings under the CCAA would continue until the filing of the certificate of completion by the Monitor or until the Court otherwise orders. Upon completion of the Plan of Arrangement TLC will continue to own Abkhazi Garden and Madrona Farm, among other properties, and hold more than 200 covenants throughout B.C. The proposed Plan or Arrangement is available on TLC’s website, conservancy.bc.ca, and Wolrige Mahon Limited’s website, wmltrustees.com. The Land Conservancy of BC (TLC) is a non-profit, charitable Land Trust working throughout British Columbia. TLC’s primary mandate is to benefit the community by protecting habitat for natural communities of plants and animals. Founded in 1997, TLC is a membership-based and governed by an elected, volunteer Board of Directors. TLC relies on a strong membership and volunteer base to help maintain its operations. The Friends of Maltby Lake Watershed Society learned this week that The Land Conservancy goes before Justice Fitzpatrick on Monday, February 23, 2015 in the Supreme Court of BC in Vancouver. The court will hear TLC’s entire Plan of Arrangement as it relates to all TLC properties, its creditors and operations. It is a critical step forward for TLC, protecting not only Maltby Lake but also other unique TLC properties. Included in the Plan of Arrangement, The Land Conservancy has signed a $750,000 offer from Woody and Carmel Thomson to purchase the majority of TLC’s interest in Maltby Lake. While the final disposition of the Agreement rests with the BC Supreme Court Justice, the Thomsons have signed a document as part of their offer, guaranteeing legally binding conservation, covenant and protection articles that would help preserve Maltby Lake’s biodiversity and expansive watershed, and would honour the intent of the donor who originally gifted the property to the TLC. Once the Plan is approved by the Court, the arrangement would be binding on The Land Conservancy and all other parties included in the Plan. TLC may choose to retain its remaining interest in the property or sell it to the community. To date, $180,000 has been pledged by community, family and neighbours towards the $250,000 needed to purchase the property, if the TLC makes the land available. In his 12th Report to the Court, the Monitor agreed to TLC’s application to obtain from the Court on February 23, 2015 an order to proceed with the Plan. He also recommended TLC be granted an extension to April 30, 2015 to allow TLC time to finalize the terms of the Plan and to meet with its creditors to vote on the Plan. Barring any adverse affects, it is anticipated the Plan could be finalized by April 2, 2015. Lots of GOOD NEWS to share & an Appeal for Help! TLC’s 35% interest in Maltby Lake is part of TLC’s overall “Plan of Arrangement”. TLC has accepted Carmel & Woody Thomson’s offer to purchase a large portion of its interest in Maltby Lake: 29% of the Maltby Lake lands for $750,000. It is hoped funds to purchase TLC’s remaining 6% interest can be raised by reaching out to the community. Friends of the Maltby Lake Watershed Society working with their community partners are grateful to those who have to date pledged $178,000 towards its $250,000 goal to purchase the remaining 6%. Thank you! Small and large amounts are gratefully accepted by completing the pledge form under our pledge link. A group of creditors is ready to forgive about $2 million owed by The Land Conservancy of B.C. in order to help preserve ecologically important properties. In addition, a coalition of other trusts is banding together with a proposal to pay $1.5 million to buy properties from The Land Conservancy and protect them, said John Shields, the organization’s operations manage. Further details are not being immediately released. 12 townhouses and a home to be built on an adjoining lot. Instead, the idea is to sell that housing development potential to a developer to build on another location. The proposal would require City of Victoria approval following public hearings. These are some of the pieces of a complex puzzle the Victoria-based conservancy is trying to arrange in a plan that would allow it to climb out of a debt of $8 million while preserving as many of its properties as possible. More than a year has passed since The Land Conservancy sought court approved protection from creditors. Wolrige and Mahon, the court-appointed monitor, is asking for an extension to April 30. The Land Conservancy owns about 50 properties, with ecological and heritage value, around the province. Some have been sold and others are expected to be sold to pay debts. The process has been complicated by legal fights about what should happen with particular sites. Many properties have their own group of advocates, who do not necessarily agree with The Land Conservancy plans. A court case saw The Land Conservancy lose the Binning House in West Vancouver after a challenge over a will. Families of former owners and part-owners of land are also in disputes with the organization. One group working with The Land Conservancy is the Ross Bay Villa Society, which has raised $88,000 toward its $130,000 goal. The society is hoping to pay off the mortgage and take ownership of the partly restored heritage house from The Land Conservancy. Debt consists of about $3 million to secured creditors, $1.5 million to professionals such as the monitor and lawyers, and $3.5 million to unsecured creditors. Secured creditors will be paid in full, Shields said. A meeting of creditors was held this month to find out if there was interest in giving the organization more time to pay or in forgiving all or part of its debts with the goal of staving off sales of important properties. A letter was also sent to all unsecured creditors. The amount that unsecured creditors appear willing to forgive works out to about $2 million, under the formula set out in federal legislation for a proposal to succeed. A plan outlining the creditors’ willingness to forgive some of the debt will go before the Supreme Court on Feb. 23. Shields is hoping the monitor will support it. If the court agrees, the proposal will go to the creditors for a meeting, likely to be held March 30. CBC Interview with John Sheilds, TLC Executive Director, on January 8, 2015. References the creditors meeting and next steps for the organization that holds the fate of many properties, including Malty Lake, in their hands. John Woody Thomson and Carmel Thomson outside their home on the edge of Maltby Lake in West Saanich. The fate of a pristine West Saanich lake and its surrounding woodland remains in the hands of the Supreme Court of B.C. as two parties fight to purchase a stake in the property from The Land Conservancy of B.C. Maltby Lake, an 18-acre private lake about 1.5 kilometres south of Prospect Lake, is home to freshwater jellyfish and sponges, painted turtles, cutthroat trout and considered one of the best examples of undisturbed ecologicial diversity in the Capital Region. “Right now, our goal is to get the land in our hands for safe keeping. That’s the only way we can safeguard it in perpetuity,” said Carmel Thomson, a self-described “environmental steward” and resident of Maltby Lake with husband John “Woody” Thomson. The couple own a 10 per cent stake in the 170-acre lands surrounding the lake, while another 55 per cent belongs to members of the Holmes and Dumbleton family. The Land Conservancy owns the remaining 35 per cent, valued at just over $2 million, according to documents filed by court-appointed monitor Wolrige Mahon Ltd. last week. The monitor is overseeing the sale of some of 8,300 acres of TLC assets to help pay down $7.5 million the conservation society owes to creditors. The Maltby sale is now leading to a very public dispute between the Thomsons and the property’s other three owners, collectively known as the Holmes Group. “The other families are saying they have no immediate plans to develop the properties, but they’re not promising an environmental covenant like we are,” Woody said. Lana Popham, B.C. MLA for Saanich South, attended a Dec. 15 court hearing with the Thomsons and said she’s been mindful of respecting the private ownership of the land. “But because TLC is involved, I think it’s in the public interest to watch this situation closely,” Popham said. “It’s fair to say all the owners have been stewarding the lake to this point, but whatever solution we come up with as far as who owns what, the area needs to be protected,” Popham added. Complicating the issue is the fact that none of the owners possess legally distinct parcels of land. Rather, each owner holds a percentage of the overall property as an undivided interest. The TLC is keen to accept a $750,000 offer from the Thomsons to purchase a portion of its land, but the monitor states the amount isn’t adequate. The Thomsons hope to convert the land to a protected park and say they’ve already received more than $170,000 in pledges from the Friends of Maltby Lake Watershed Society and others in the community to purchase the TLC’s remaining stake. The Thomsons have promised to sign an agreement with TLC where they would eventually transfer the land to another land trust or the municipality, though many factors remain unclear. “This is invaluable land, but we’re offering what we can to keep it protected,” Carmel said. Properties purchased by TLC are regulated under the Charitable Purposes Preservation Act of B.C. (CPPA), which prevents land within a trust to be sold or seized to repay debts. A judge must now decide how to proceed with the Maltby sale, expected sometime in early 2015. Whatever the outcome, it’s clear the lake offers a pristine watershed championed for protection by biologists from the Peninsula Streams Society and Friends of Tod Creek Watershed. The Land Conservancy and its monitor are squaring off over the fate of Maltby Lake in Saanich this morning in the Supreme Court of B.C. in Vancouver. 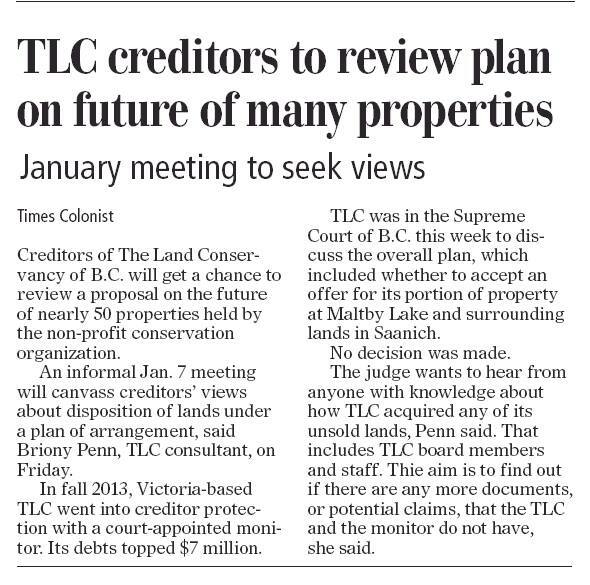 At issue is what will happen to land partly owned by the Victoria-based, non-profit TLC, a conservation organization in creditor protection. Maltby Lake property consists of approximately 170 acres of land and 18 acres of lake. It has been in the Holmes and Dumbleton family for more than a century, a report from the court-appointed monitor states in his latest report. Members of the Holmes family hold 55 per cent of the land, 35 per cent was willed to the TLC, and another 10 per cent is owned by the Thomson family. TLC’s holdings were willed to it by Catherine Holmes, who had hoped that “Pip’s Park,” in honour of her late husband, would be established, although that wish is not legally binding, the monitor said. B.C. Assessment values the Maltby Lake property at $5.9 million. The TLC’s share would be worth $2 million, the monitor said. Its board accepted an offer of $750,000 from Thomson. Under that plan, the TLC would retain six per cent of the property, giving it a say in its future. The Holmes family offered $1 million, the monitor’s report said. Briony Penn, serving as a TLC consultant, said the Thomson offer is preferred because it has more protective covenants and it most closely meets the intentions of Catherine Holmes. No sale can take place without approval of the court. The monitor said that neither offer is acceptable. He wants a sale price closer to appraised values and also said that wishes of creditors need to be taken into account. The organization is more than $7.5 million in debt. Dear Friends,This Monday a BC Supreme Court will hear arguments about the future of Maltby Lake.